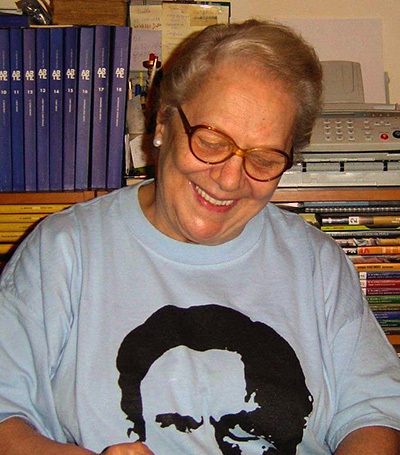 In 1997 Angela Molteni and a 22 years old student created the website www.pasolini.net . This was the beginning of an extraordinary cultural adventure in which Angela put together lots of aspects of herself and of her literary, cultural and civil competences. From one hand there was her professional competence in the editorial field, reached during her collaborations with many publishing houses; on the other hand there was her passionate and willing involvement in the promotion of Pasolini’s work, especially among young people and the divulgation of a myriad of activities all over the world in order to enhance its ever-current meaning: some essays contained in the ever- expending critical biography, or else the journalistic and militant material, or some promotional manifestations and conventions; or finally theatrical, cinematographic and musical artistic works. From the year of its foundation the website has attracted a copious group of collaborators and friends thanks to its “pagine corsare” and it has increased to the point of becoming the wider widespread on line archive of Pasolini’s material. It reaches 5 million visitors from more than 60 countries in the world and contains about 13.000 documents, divided into different sections. In 2012 an independent blog was also created but its update was suspended because of the unexpected death of its author after a devasting disease. After the last news published by Angela Molteni in October 2013 the management of the blog was given to Pier Paolo Pasolini Study Centre. The blog entitled “Angela Molteni’s Archive” and the corpus of “Pagine Corsare” are operative at the Study Centre’s website that recovers the pages published by Angela Molteni and keeps loading files following the author and her family’s intentions. The director of the study Centre, Angela Felice, is responsible for its redaction and leads a group of collaborators, among which participate Giacomo Trevisan and Alessandro Scialpi. “Mi ha insegnato, infatti, a essere più lucida, meno istintiva nell’affrontare le vicende più controverse che possono avvelenare l’esistenza; a non accettare compromessi di alcun tipo; a non dare troppo peso al denaro; a stare alla larga dalla televisione; a provare vera gioia ammirando un dipinto, perfino se custodito in una chiesa; a non cambiare le mie idee ad ogni stormir di fronde; ad apprezzare la lealtà, l’amicizia, la generosità che era un tratto tanto caratteristico della personalità pasoliniana; a non assumere un determinato comportamento perché «è di moda»; a stigmatizzare profondamente le gerarchie ecclesiastiche quando ingeriscono pesantemente sul pensiero e sul comportamento delle persone. In una parola: a non conformarmi per ignoranza o per pigrizia mentale a ciò che viene definito comunemente “la normalità”.